Zen headboard is a beech wooden trapezoidal panel 19mm thick, squared or with rounded corners. It's snap-fit assembled in two miillings set in the outer seams. When assembled, it's inclined at an angle of 10°. Available 50 or 60cm high. 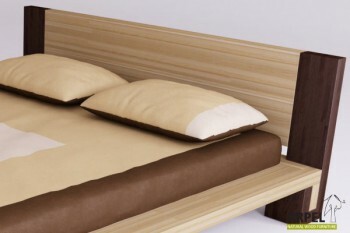 Shaped wooden panel snap-fit assembled in the millings set in the head beam of Aiko bed. 19mm thick, the headboard is blocked both with peculiar wooden hooks and screws provided with covering stoppers. Bali headboard is a solid lamellar beech wooden panel 19mm thick with a closing top 6cm thick that is assembled in the millings set in the back feet of the bed. The feet become as high as the headboard. In a one-coloured bed the central panel matches the colour of the frame and the feet. Solid lamellar beeh wooden panel 19mm thick connected to the bed frame with a tubular beech wooden structure of 6x6cm whose colour matches with the colour of the frame ; the panel can have a contrasting colour.